© Johannes Neumann, Umbruch Bildarchiv e.V. 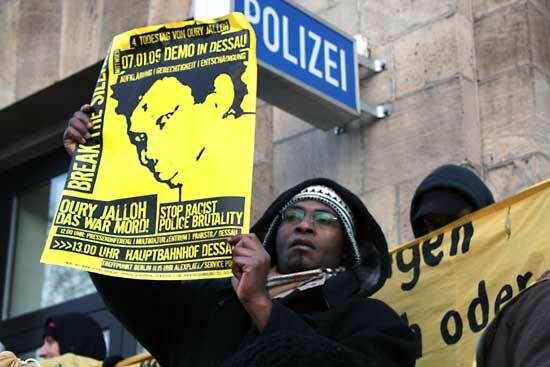 On January 7, 2005, Oury Jalloh, an African man who had come to Germany seeking asylum, burned to death while shackled to the floor of a Dessau jail cell. Three years later two police officers were prosecuted on charges of wrongful death and acquitted. Massive protests resulted in an appeal of the verdict, and, five years to the day of Jalloh’s death, the German Federal Court of Justice ruled in favor of re-opening the case against the police. Written in response to these events, The Most Unsatisfied Town highlights the insidious ways that institutionalized racism and asylum policy leave individuals vulnerable to gross human rights violations, and explores tensions between perceived truth and reality, reparation and gratification, triumph and loss, and the personal cost of mobilizing for social justice. Playwright and performer Amy Evans seeks through her work to critically examine the impact of displacement, alienation and political violence on the human spirit. She has been the recipient of numerous grants and awards, and her work has appeared in several publications, including “Velocity: The Best of Apples and Snakes” (Black Spring Press, 2003); “Mythen, Masken, Subjekte: Kritische Weißseinforschung in Deutschland” (Unrast, 2005), and “How Long Is Never?” (Josef Weinberger, 2007). Amy Evans is currently a resident fellow at the ICI Berlin. This event is free and open to the public. In English. Subscribe and receive email updates of postings and events.